Using law as a tool for social justice. 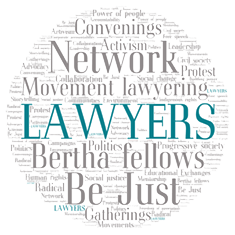 Bertha Foundation supports two-year fellowships for emerging lawyers – Be Just Fellows – as the first step from university into a career in public interest law. We work to create a clear career track in public interest and movement lawyering. The fellowship provides funding for emerging lawyers’ salaries at the best public interest law centers around the world – the Be Just Network – where they receive practical training from renowned professionals. To apply for this job please visit www.berthafoundation.org.